Blue Man Group Creates High-Tech NYC Preschool The founders of the quirky Blue Man Group trio have opened a preschool in New York's East Village with a padded room, climbing wall and light floor with high-tech games. The Blue School — at up to $27,000 a year — is an experiment to help kids explore "divergent thinking." The Blue Man Group has grown from three quirky performance artists to a multimillion dollar operation with seven companies in North America, Europe and Japan. One of its latest ventures is a preschool in New York City. Kids play at the Blue School, which also has a padded room, climbing wall and light floor with high-tech games. 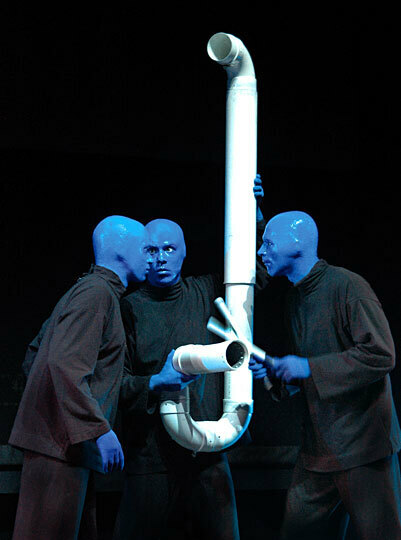 You may have come across Blue Man Group over the years — the humanoid trio with blue heads who play weird instruments on stage and do crazy things. But Blue Man Group is no longer three quirky performance artists; they are a multimillion dollar operation with seven companies in North America, Europe and Japan. The original founders of the group have started a preschool in New York's East Village that is called — appropriately — Blue School. At first glance, Blue School seems very normal in comparison to the blue-headed performance artists. There are cheery classrooms, books, clay, blocks — all the things expected in a good preschool. There are a few Blue Man things, like the speaking tubes that snake along the ceiling and allow kids to speak to each other from a distance. 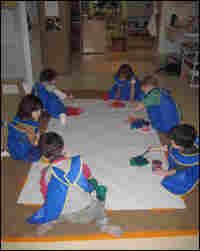 In the kindergarten, children build a triangle building with blocks, while an art specialist asks another group of children if they want to draw characters out of a particular book, or create their own stories. "I want to make up my own story," they all shout. But every once in a while, there is something a little different than a typical kindergarten class. A student immersed herself in shaving cream, piled high on a table. Teacher Nancy Simko cleaned it up. "It was a material that they were exploring, and they ended up exploring it very deeply from head to toe," she says while laughing. "Every parent who came in said, 'My kid could never do this at home.' It is a little messy; it is a little out of control. But now it is done, and we can clean it up." Then there is the "Wonder Room." It's a small room filled with padded structures so kids can jump around, and a climbing wall. But if you pull the pads up, there is an interactive light floor with high-tech games. They also use black light during something they call "glow time," when they create a more serene atmosphere. Chris Wink, one of the founders of Blue Man Group and Blue School, says they were trying to create a space "that can move from serene, meditative and simple; to complex, high-tech and fast moving." The founders of Blue School clearly felt that something was missing in their own education. This issue is personal for them. "I went to a fancy school, I went to a fancy college, and I went to graduate school," says co-founder Matt Goldman. "It wasn't until my last year in graduate school that I started having excitement, vigor and passion for my education." Phil Stanton, another co-founder, adds, "We are parents now, and you want to make it right for them, and that ups the ante quite a bit." Stanton says Blue Man Group came together to celebrate curiosity and creativity. They wanted to combine art and comedy, music, science and technology. At the time, they could just as easily have created a school, he says. And even the character of the blue man "is really like an adult child in his innocence," Stanton says. "He looks at objects that are common to us and uses them in a different way, but a creative way." Ian Kerner happened upon the play group the founders began for their kids, before there ever was a school. A therapist and author, he loved the spontaneity and energy of the group. His son, Owen, was in a well-respected private nursery school that Kerner describes as "tried and true." He describes Blue School as "true and new," which he finds very attractive. The Blue School has brought in educational reformers from Britain; they're incorporating the Italian Reggio Emilia approach to education, which emphasizes exploration, community and parent involvement — and revisiting ideas in many media. This year, they had more than 200 applicants for 30 spots. Eventually, they hope the school will offer classes up to fifth grade. But, of course, there's the price. Elite schools in Manhattan like Trinity and Horace Mann charge as much as $32,000 a year. Blue School is a New York City private school. Goldman says they took the price of all the private, independent schools in the city, found the mean, took about $10 off, and set the tuition: $27,000 a year for kindergarten. As they set up the school, the founders say everything was more expensive than they thought. But they emphasize that what they are doing is an experiment, which will only be successful if their ideas get picked up by educators and schools that don't have similar resources. It's more than the gadgets, they say. They talk a lot about "divergent thinking." They believe that America's complex and fast-paced society needs to teach kids to think in multiple ways. Of course, school reformers have been arguing about some of these issues for more than a century. There is clearly a new mix here: a lot of high-tech ideas mixed with European educational theory. But it's not totally clear how much of this is really new. Is Blue School simply a well-endowed, progressive preschool, at a time in history when there are fewer and fewer of them around? Or is it something more? Goldman says the school is very much "in process," but he believes that the best proof that something going on here is very right is what takes place at his home every Saturday morning. His kid wakes up and says, "Let's go to Blue School." When Goldman says "no," he has a very disappointed 4-year-old.